Cricket does strange things to you. It is a team game that is almost entirely dependent on individual performance. Its combination of time, opportunity, and the constant threat of disaster can drive its participants to despair. To survive a single delivery propelled at almost one hundred miles an hour takes the body and brain to the edges of their capabilities, yet its abiding image is of the gentle village green, and the glorious absurdities of the amateur game. 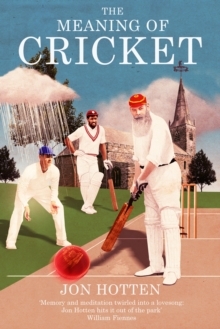 In The Meaning of Cricket, Jon Hotten attempts to understand this fascinating, frustrating and complex sport. Blending legendary players, from Vivian Richards to Mark Ramprakash, Kevin Pietersen to Ricky Ponting, with his own cricketing story, he explores the funny, moving and melancholic impact the game can have on an individual life.